Finland under-19 international Miko Virtanen has signed for Aberdeen after impressing during a week-long trial at Pittodrie. The 18-year-old played as a trialist in last week’s 3-1 victory against Hearts in the SPFL Development League. Virtanen, who spent the past two years with English Premier League club Everton, has signed a contract until the end of the season and will join Paul Sheerin’s under-20 squad. The central midfielder said: “I know Mixu Paatelainen, the Finland national team manager, used to play here. “I also knew a bit about Scottish football from following his time as a manager in this country. 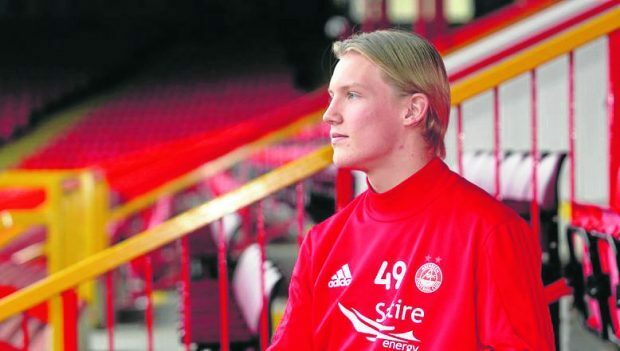 “People have also told me about Markus Heikkinen (the Finnish defensive midfielder who played for the Dons between 2003 and 2005). “I already knew that Aberdeen were in the top bracket of Scottish football, that they finished second last season and they played in the Europa League qualifiers. “When I heard I was coming here I went and read up on the history of Aberdeen and I realised very quickly how big and successful a club it was. “I was very excited to come here. “I have a deal until the end of the season which gives me time to prove myself. l Former Aberdeen midfielder Graham Leggat will be posthumously inducted into the Aberdeen FC hall of fame this month. Leggat played for the Dons from 1953 to 1958 and was part of the title-winning side of 1954-55. He later played for Fulham Athletic, Birmingham City, Rotherham United and Toronto Metros. Leggat, who died two years ago, was capped 18 times by Scotland, scoring eight goals. Neale Cooper, John McMaster and Archie Knox will also be inducted at the event at Pittodrie on Friday, November 10.